Saint Francis Medical Center’s Level III Neonatal Intensive Care Unit (NICU) is known for its expertise. About half of the sick infants who receive care there are transported from other hospitals. “When babies are born with difficulty breathing or brain injuries, staff at hospitals know we have the people, knowledge and equipment to care for them,” says Alan R. Barnette, MD, FAAP, neonatologist, Saint Francis Medical Partner. 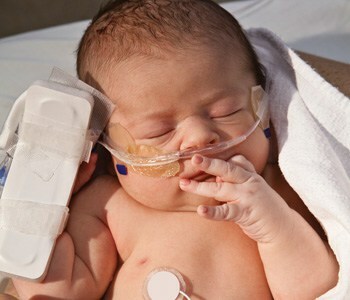 A most critical time for sick newborns is right after birth, when they transition from the womb to the outside world. When possible, Saint Francis’ NICU transport team is present for the delivery of a preterm or sick baby at another facility. After delivery and during transport, the team provides breathing, blood pressure and temperature support for the baby. After reaching Saint Francis, the newborn will have access to an even bigger team of experts, including occupational, speech and physical therapists; respiratory therapists; and doctors, nurses and nurse practitioners who specialize in treating sick infants. “Our team members work together, which results in better long-term outcomes for the infants,” says Barnette. To learn more about services Saint Francis offers through its Level III NICU, talk to your obstetrician or call 573-331-3996.